HTMLGIANT / Hey, want to be in a book? … Get in the chair. Hey, want to be in a book? … Get in the chair. Dear Whoever this is a picture of, Call me? CALL FOR SUBMISSIONS! We are seeking high quality photographs of your literary tattoos for an upcoming book. Send us your ink! Submissions are open to all kinds of literary tattoo work: quotations from your favorite writer, opening lines of novels, lines of verse, literary portraits or illustrations. From Shakespeare to Bukowski to The Little Prince in a Baobab tree, if it’s a literary tattoo and its on your body, we want to see it. All images must include the name (or pseudonym) of the tattoo bearer, city and state or country, and a transcription of the text itself, along with its source. For portraits or illustrations, please include the name of the author or book on which it’s based. And of course, you are heartily encouraged to credit the artist who did your work. We’d also like to read a few words about the tattoo’s meaning to you — why you chose it, when you first read that poem or book, or how its meaning has evolved over time. 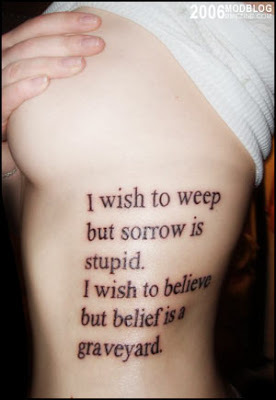 How much (or how little) you choose to say about your tattoo is up to you, but a paragraph or two should do the trick. Please send clear digital images of the highest print quality possible to tattoolit@gmail.com. Pixel resolutions should be at least 1500 x 1200, or a minimum 300 dpi at 5 inches wide. Text should be included in the body of the email, not as an attached document. Also be sure to include one or more pieces of contact information, so we can let you know if you’re going to be in the book.